Aspirations are dreams and goals that one sets for oneself in life. In the absence of aspirations, life is bound to stagnate as the individual would have nothing to look forward to, work towards and achieve. Aspirations are a manifestation of a person’s personality and thought process and varies from individual to individual. They provide a sense of purpose to the person and give immense joy once they are fulfilled. A. Aspirations cannot be unrealistic. The very purpose of aspiring to do something is to, one day, achieve it. In childhood, one aspires to be multiple things at the same time, a doctor, a scientist, an engineer, an officer in the army and so on. This is because one is free of all external influences that shape one’s life in childhood and the ability to rationalise is still at a nascent stage. As one grows up, one realises the need to temper these aspirations and align it with reality. One realises that one cannot be everything at the same time and needs to focus on that which one really wants. B. Just like everything else, one needs to be passionate about his/her aspirations as well. Passion should be the driving force that dictates what one aspires to be. In the absence of passion, aspirations would remain unfulfilled. C. The very fact that people have been able to build technology that is helping humanity, create big businesses, revolutionise the world through their inventions means that there are people who are willing to work hard to achieve the aspirations that they have. Clearly, aspirations can be fulfilled only when one is determined to toil hard and long with self-belief and in the right direction. There is no substitute to hard work. D. Also, it is important to aspire and dream. If a person is not aware of his/her aspirations in the first place, he/she will remain oblivious of the many opportunities that stand before him/her. In the absence of a goal, such a person will remain like a headless chicken, going in different directions and would never experience the joy of achieving one’s aspirations and dreams. E. I believe in living with the flow. It’s good to have aspirations as they give a certain direction to life. But life, essentially, is uncertain and unpredictable. The way to enjoy and live life fully is not by structuring it but by flowing with it and being ready to accept whatever challenges life throws at you. F. This way everything that comes your way will be a surprise. But this does not mean that one does not aspire. Aspirations are necessary as they give a sense of purpose in life. If one aspires to be a big businessman, one needs to work in that direction. By setting a goal for yourself, you are challenging yourself to test your limits and achieve something which, otherwise, you may not have considered yourself confident of achieving. This push that aspirations provide can be crucial, especially when the chips are down. Clearly, aspirations are essential to human existence. They are a source of improvement for human beings. 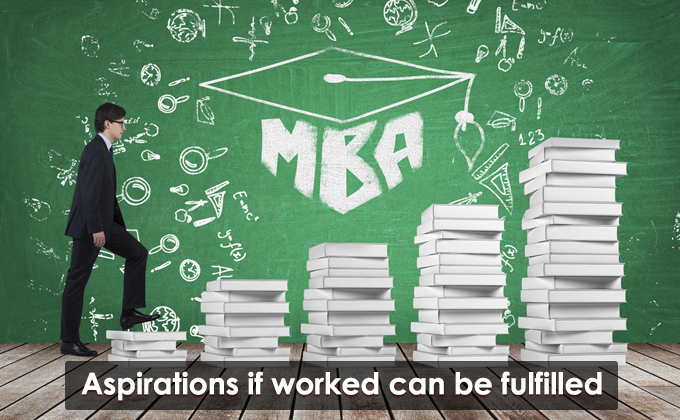 A person who aspires and works hard to fulfil those aspirations will surely be in a better position than he would have been without any aspirations. Each one us should aspire for great things but at the same time, willing to toil hard to fulfil these aspirations.